Ever noticed that when you wear nickel-plated rings the space in between your fingers becomes all red and cracked? Or that every time you wash up at your mum's house, your hands become a bit sore and itchy? When this happens you are no doubt suffering from contact dermatitis, a usually mild skin reaction that results in a rash when your skin comes into contact with something that is irritating to it. Contact dermatitis is common but nonetheless can be very irritating for sufferers. The good news is that once you know what the triggers are, in most cases it is easily prevented. 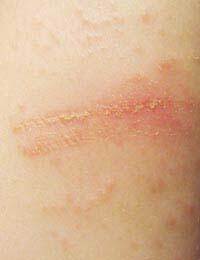 Irritant contact dermatitis: Caused by either chemical or physical irritants. The first catergory includes substances such as solvents, chemicals, and strong soap. The second is usually caused by low humidity from air conditioning and plants. It is estimated that about 80 percent of all contact dermatitis cases are irritant-caused, which includes some bizarre substances such as cement. Allergen contact dermatitis: This is less common than irritant contact dermatitis, with the irritants including nickel, gold and the oily substance of some plants. Previous exposure to the irritant is needed to produce a response, as the cause is hypersensitivity after exposure. Photocontact dermatitis: Triggered when a usually harmless substance gets in contact with the skin, and then is triggered by ultraviolet light. Results in an eczema-like condition and can be stopped by covering up in the sun. With irritant contact dermatitis, sufferes can experience either acute or chronic symptoms. The first can result in anything form a mild rash to severe blistering. Chronic signs of the condition are patches of inflamed skin that may be red and itchy, which thicken over time. Allergic contact dermatitis is a bit different. Sufferers may notice a reaction when they wear a certain waistband or have a persistent itch when they wear a specific type of earring. Bistering can occur, although often an itchy reddened rash is the main symptom. In rare cases, people who experience allergic contact dermatitis will get itching and raised red bumps in a place apart from the allergen site. In very red cases, an obstruction of the airways can occur, which will need immediate medical attention. One thing to keep in mind is that the symptoms can get worse over time if the exposure to the allergen persists. The skin will get thicker and redder, and the pigmentation can completely change colour. Diagnosis is important to determine the cause of the eczema-like reaction, which means you need to see your doctor promptly. You will also need to see your doctor to rule out other conditions, such as eczema or a fungal infection. Allergic contact dermatitis is usually evident anywhere from 48 to 72 hours after being exposed to the substance. If things are worse on holidays or weekends, the substance may be holiday-related (due to paints, chemicals, cement etc). If the dermatitis is worse during the week, the susbtance may be found at your workplace. Plant allergens and those triggered by light are also something to think about. The site of the rash can determine the culprit – an eyelid rash may be indicative of a cosmetic allergy, a forehead rash may be the result of an allergy to hair dye. And a rash in the shape of a belt buckle (yes, that actually happens) could be an allergy to nickel! Treatment is usually not that difficult, once you have identified the culprit, often by a patch test to confirm the diagnosis. A steroid cream can usually clear up the immediate problem, bu then you have to map out ways of avoiding the irritant in future. Depending on what the irritant is, this can be easy or difficult. In some cases, people need to wear gloves when performing certain activities, or use a barrier cream. Rarely, people may even have to change professions if the reaction to the irritant is severe, and cannot be avoided. Minimising exposure is key. Contact dermatitis can be annoying, and it's important to fund out what the underlying irritant is to minimise any long-term skin damage. Once the cause has been pinpointed, you are well on the road to recovery. I want solution of my skin problem . Have white colour spot on my legs and near by eye between heir.